Comfortable and causal, that is my style these days. Chubby cheeks and sleepy eyes. 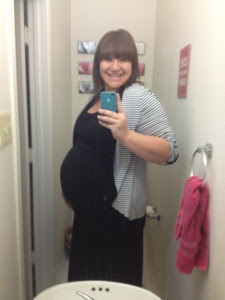 Can you believe I will be 37 weeks tomorrow!? I find myself constantly thinking and dreaming about Cooper. Does that mean he will come sooner rather than later? Doubtful- this little man seems pretty comfortable inside my belly. Also, I cried on the way to work today because I heard that country song “rock me mama” – no particular reason other than picturing me holding my babes in a few weeks. Random exciting facts about my weekend: We are hitting up the farmers market tomorrow and State Fair on Sunday! I refuse to leave the State Fair until I eat cheese curds and a grilled cheese. Fine, I’ll share – but I am not leaving until those two foods enter my belly. You’ve been warned, Justin Sieb. Do something fun and get outside to enjoy this beautiful weather!